We live in a corporate world where everything must be done at speed. Everything must be done so fast that we must be able to multi-task. 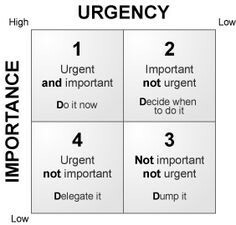 Stephen Covey’s quadrant comes in handy when organising our daily home and work lives. On the odd occasion work and home life merge together as one. We live life at a fast pace! We live in an age where we are bombarded with more and more information. We must respond based on immediate gut reaction. Some people may like to think that they make decisions based on facts, environment, etc, and to some extent that may be true but you can never have all the data you need to make an accurate decision. If you did, that’s what is called analysis paralysis. What is a Corporate Challenger? Now, the Corporate Challenger is someone who takes their time. Who is mindful of their day to day work and the activities that he/she needs to carry out. The Corporate Challenger will challenge you and everyone else in terms of taking their time to judge what is happening. Being a Corporate Challenger is a task all on its own. It means, not multi-tasking with e-mail on or telephone to ear whilst typing. It means being at home, turning the phone off and focusing on your family. It means taking the time to pick up the phone and have a conversation with a friend rather than texting while eating a sandwich. It means being present, it means being focused, it means giving the most you can to each task. It means stopping and reflecting on what it is that you’re doing. I don’t know about you but many times I have come home and told my better half about how hard I’ve worked that day, but I’d achieved absolutely nothing! It means getting rid of days like those and concentrating on what it is that you want to achieve. It means planning, it means composure, it means slowing down! That is a skill and a virtue these days. The most surprising thing is that it is not recognised in the corporate world! So, join me, become a Corporate Challenger. Challenge yourself, challenge others. Make decisions based on time, reflection, pausing. Make true connections with colleagues, with peers and direct reports as well as family and friends. You’ll feel better and more informed in the long run and you might even notice that it rubs off on everyone else around you too!